Harness your inner gifts, foster awareness as you learn tools for personal power, divine connection, and awakening to your purpose. The Youth Squad of Panther Valley Ecumenical Church will be hosting a Pancake Breakfast on Saturday, March 16. The proceeds from the Pancake Breakfast will benefit the Campership Program at Panther Valley Ecumenical Church. Tickets prices are $5 per serving. The church is located at 1490 Route 517, Hackettstown. Call 908-852-5444 for further information. Join Morris Organizers founders Barbara and Russ for an interactive discussion focused on strategies for managing the chaos associated with family life in 2019. They’ll share tips and tricks for staying ahead of the clutter, how to manage projects, and when and where to find help, followed by a lively Q&A to help tackle specific concerns. Please RSVP to hworkshop@womenswellnessnj.com to reserve your spot to this free event and for more information. Join our presenter Anthony Lusardi as he showcases some great spaghetti westerns as well as lesser known ones. Discussion and questions will follow after the presentation. Registration is required, please sign up online at www.warrenlib.org. This event will be held at the Warren County Library, Northeast Branch. Our Annual Corn Beef & Cabbage Dinner will be held on Friday March 15th for lunch and Saturday March 16th for dinner. Pick up either day. It's your choice. Dinner includes: Corn Beef, Cabbage, Boiled Potatoes, Carrots, Irish Soda Bread and a small beverage. Please call ahead to reserve as quantities are limited and dinners go very quickly. Happy St. Patrick's Day!!! Our Annual Corn Beef & Cabbage Dinner @ Tony's Luncheonette will be held on Friday March 15th for lunch and Saturday March 16th for dinner. Pick up either day. It's your choice. Dinner includes: Corn Beef, Cabbage, Boiled Potatoes, Carrots, Irish Soda Bread and a small beverage. Please call ahead to reserve as quantities are limited and dinners go very quickly. # 908-852-5962. We are located on Rt. 57 in Mansfield NJ across from Bottle King. Happy St. Patrick's Day!!! 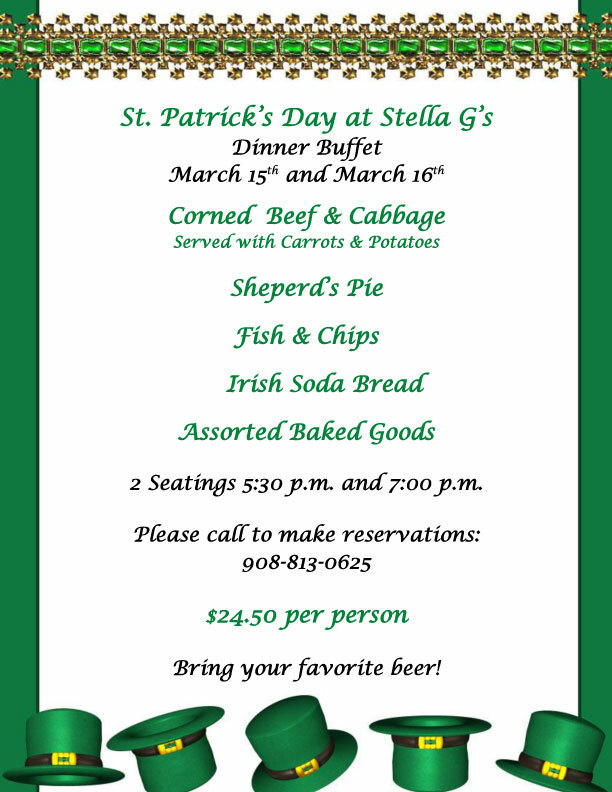 Stella G's is celebrating St. Patrick's Day with an Irish dinner buffet. Make your reservations for either the 5:30 pm or 7:00 pm seating. 142 Liberty Street, walking distance to Main Street. Two great local bands on stage, doors open 7:00 pm, low cost beverages and you can bring your own food in. Come out and celebrate St Pat's with us!